Celebrating the Fourth of July at Walt Disney World Resort! 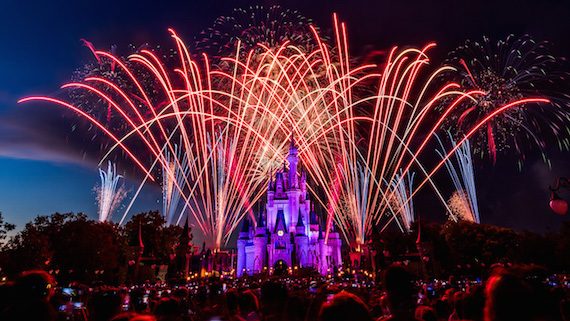 Magic Kingdom® Park – “Disney’s Celebrate America! A Fourth of July Concert in the Sky” rockets into the air above – and all around – the park. This special, fireworks spectacular will be presented two nights in a row, at 9 p.m. on both July 3 and 4. You can also rock out each night to DJ dance parties in Tomorrowland and Frontierland, each a great location from which to catch the fireworks! Epcot® – On July 4, you can enjoy special evening concerts of great American songs by Voices of Liberty at 5:30 p.m., 6:45 p.m. and 8 p.m. at the America Gardens Theater. Throughout the day, you can also meet Mickey and the gang in patriotic attire outside The American Adventure, and at 9 p.m. that night “IllumiNations: Reflections of Earth” joins the celebration with the addition of a heart-pounding, all-American grand finale! Disney’s Hollywood Studios® – You can spend the Fourth celebrating some of the great icons of American popular culture at Disney’s Hollywood Studios, with “The Music of Pixar LIVE! A Symphony of Characters” at 5 p.m., 6:45 p.m. and 8 p.m., the all-new “Disney Movie Magic” experience at 9 p.m. and “Star Wars: A Galactic Spectacular” which takes to the skies at 9:30 p.m. with fireworks, lasers, projection effects and more! This entry was posted on June 27, 2017 at 2:06 pm and is filed under Disney News, Special Events, Walt Disney World. You can follow any responses to this entry through the RSS 2.0 feed. You can leave a response or trackback from your own site.